Homemaking Simplified: Losing My Daddy. In Memory of Samuel Garcia 02-12-1949 to 08-23-2016. Losing My Daddy. In Memory of Samuel Garcia 02-12-1949 to 08-23-2016. My wedding day, Dec. 2, 2007. It's funny, I have found writing to be therapeutic to me since my youth. I always kept journals either in paper or digital form, but when I got married back in 2007, my "need" for writing seemed to disappear. Perhaps it was because I had found a new confidant in my best friend and husband, Peter. Over the years as we grew I found two new confidants that I had not known before: my dad and my mom. Although we always had a good relationship, over the years, my dad became such an amazing friend. One we could invite to dinner to chat with about virtually anything: theology, health, holistic living, familial issues, friendships, heartache, joy, anything at all. He was always a great listening ear and an encourager of peace, love, and unity among others. He could council and assist and even when I disagreed with his opinions, I always knew that he was sincere and with honorable motives. On September 23, 2016 my dad, Samuel, passed into eternity leaving behind his precious body as his soul was freed from the cancer he was diagnosed with only two short weeks before. Having pain in his body for a few months, he went improperly diagnosed until then. My dad is a faithful man who never doubted the efficacy of prayer nor the ability for the body to heal itself when fueled properly. Despite my dad's weight, he was very conscientious about what he ate and what types of products he used. He had personally witnessed relatives and close friends healed of advanced cancers. We had much hope and faith that his too could be reversed, but it was too progressed and too late. The month of September has been a big blur. The Kaiser hospital staff and their lack of empathy and responsibility were infuriating, the lack of humanity from the Kaiser hospice was just as bad. In all of his interactions, only one person--the last doctor he saw--showed any decency. My dad had little faith in the medical system and I shared his skepticism. There was an unknown opportunity to change my mind about American medical care, but they only solidified what I had already known. But that is another topic for another day. My dad with my sister and me around 1994. It's been a little over a week now since my loss--after all, it was his gain. At first I kept myself busy with logistics and planning, I had to be strong just as I had been during the short battle we fought. As a week passed, I realized that my grief was only manifesting physically, so I have begun to allow myself to cry for the heartache and loss that I feel. It's the little things. New realities hit me on a daily basis. After arriving to my husband's out of town accommodations for a business trip, I went to text my mom and my dad to let them know we made it in safely. I went to text him first and realized that I could never do that again. Never again could I receive his text of gratitude for letting him know that we are fine, or send him photos of the kids, or call him to hear his voice. Never again. The day before yesterday my husband pulled out fish we had frozen. My dad loved wild caught fish. My husband had to leave again on a business trip and was afraid of the fish spoiling. I told him not to worry and that I would make it for the kids. I thought to myself that I would invite my dad over to share it with and immediately fell into silent tears at I realized I will not be able to invite him over for dinner, coffee, wine, or a movie. Never again. As this week has progressed, my uncle asked me for an obituary to put in the paper of my dad's hometown. I couldn't imagine having time for that. After some consideration, I delegated the task to my younger sister. Last night as I sat looking at photos of my dad I began to write and decided that I would work on his obituary. It's difficult to sum up a person's life in just a few short paragraphs. I decided to keep it centralized on how people may have known him. Because for those who knew him, there is nothing that I need to say to convince them that he was anything short of amazing. Time and time again, I am hearing stories about my dad, but the most amazing and incredible story I have repeatedly been told by his family and friends is that my dad lead them to Christ. May I have such an impact. My dad on my wedding day. Dec 2, 2007. After a short battle with cancer, Samuel “Sammy” Garcia fell asleep in the Lord on September 23, 2016 in his home in San Diego, CA at the age of 67. He leaves behind his fiancé, Jakelin Salas; his daughters, Gabriela--husband Peter Gammo--and Clarissa; as well as his grandchildren Valene, Leyah, and Peter Abraham Gammo. Samuel was born on February 12, 1949 in Oxnard, CA, to Refugio and Petra Garcia, who predeceased him. He grew up in a large and loving family. He was predeceased by his brothers Refugio Jr. and David as well as his siblings Rebecca and Daniel who died in infancy. He is survived by his siblings: Nadine, Manuel, Sarah, Ruben, Nancy, Yolanda, Mary, Patricia, and Eduardo. He also leaves behind may dear in-laws, nephews, nieces, relatives, and friends. 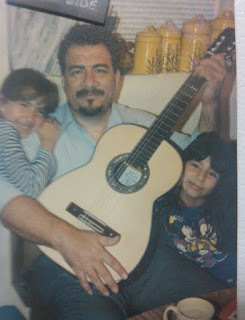 Samuel grew up in La Colonia where he played guitar—a passion and incredible talent that continued throughout his life. After high school, he attended Ventura College and transferred to Northridge College majoring in Sociology. He moved to Olympia Washington in 1979 where he dedicated his life to Christ. After that, he moved back to Oxnard where he met and married Socorro Guzman of Santa Paula in 1984. They divorced in 1994 yet remained friends who were devoted to their daughters. Samuel stayed a central figure in their lives as a wonderful and incredibly involved, loving father. Samuel worked for Child Development Resources in the 1980s in Oxnard. In 1990 he moved with his family to San Diego to open a branch of Bilingual Vocational Services. 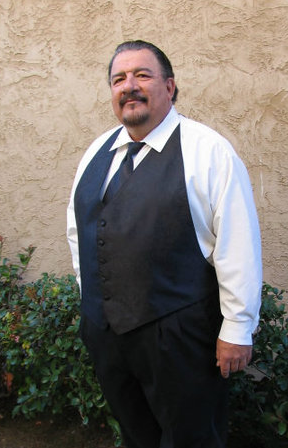 After its doors were shut, he attended San Diego State University and continued working in vocational training, teaching classes for the San Diego Career Center. Meanwhile, Samuel was a licensed life insurance agent as well as tax preparer for H&R Block in San Diego. He also taught guitar lessons and built computers. Samuel was a man of many passions and always put his entire heart into everything he pursued. Among those passions were his love for the Lord, evangelism, studying the Scriptures, and praising God through music. Also included were his love for his fiancé, his daughters, his family and friends, mentoring others, and holistic living. He entered eternity with a strong, unwavering faith. A wake and service will be held at Community Mortuary at 855 Broadway in Chula Vista on October 7, 2016 at 7 pm. Samuel requested a ground burial which will be at Holy Cross Cemetery at 4470 Hilltop Drive in San Diego on October 8, 2016 at 10:30 am. A reception will follow his burial at the South Metro Career Center—4389 Imperial Avenue, San Diego--in the Randolph Room; all are welcome. The family would especially like to thank his fiancé Jackie, for her incredible love and devotion to Samuel over the past 14 years, but especially in his last weeks of life on earth. He is now with his Savior as he has finished his race. Until we meet again, rest in peace and glory.